The Contender 27 Open was produced from 1995 through 2008, when it was replaced by the 27 Tournament. When you go out fishing on someone else’s boat, you’re usually just looking for a good day on the water, coming away with memories of fishing and friends. Sometimes, however, it’s the boat that makes the impression. 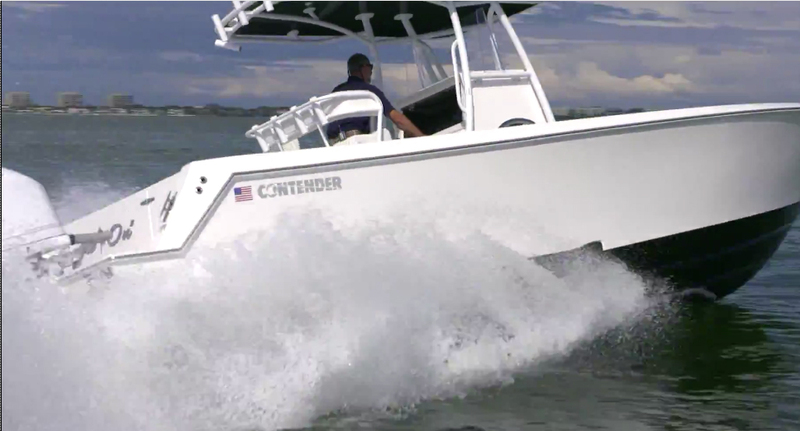 Walter Szeezil calls his Contender 27 his "sixth and last center console." That’s the way it was 15 years ago for Walter Szeezil. It was the mid-1990s, and he was fishing out of Miami with Capt. 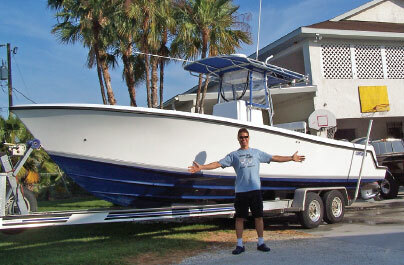 Mark Houghtaling on a Contender, a Florida-built center console designed by fisherman/company founder Joe Neber. There was something about the boat he liked, and it wasn’t just the 35-mph performance and the ride. It was also the little things — the deck, the toe kick, the raised live well, the coffin box. He was smitten they way boaters sometimes are by certain boats. “I’ve wanted one ever since,” says the 46-year old doctor from Terra Ceia, Fla.
Szeezil drove seven hours from his Tampa Bay area home to see it, had a “flawless” sea trial, and took the boat home with him. “It was in great mechanical shape,” he says. The boat had a few hull scratches, and it needed a new T-top and canvas and a better GPS, all of which he’s taken care of. Kids sit forward on the coffin box, with a recessed grab rail when it’s needed, he says. And because the deck is a single level, there’s no bridge step to trip on. Performance has been better than expected. 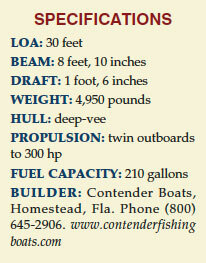 The deep-vee hull is powered by a pair of Yamaha 200-hp HPDI 2-strokes with about 900 hours. “We cruise at 32 mph and 3,600 rpm getting 1.9 mpg with a large crew aboard,” says Szeezil. That’s 8 mph faster and a half-mile per gallon better than the 26-foot power cat he owned. “I’m pleased with that,” he says. 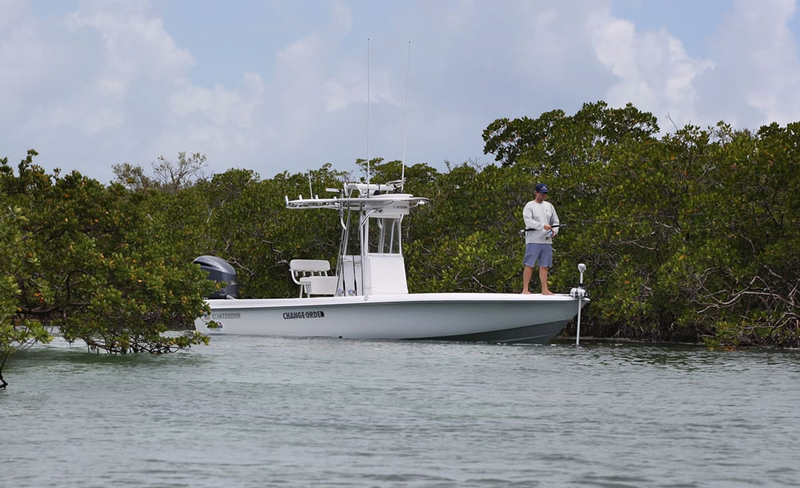 Szeezil tows the Contender with a 345-hp diesel V- 8 Dodge 2500, and the loaded boat and trailer weigh in at less than 10,000 pounds. “It tows easily, and we tow pretty quick,” he says. Tampa to Fort Lauderdale is about a four-hour trip, and he can reach the Keys in about six hours. 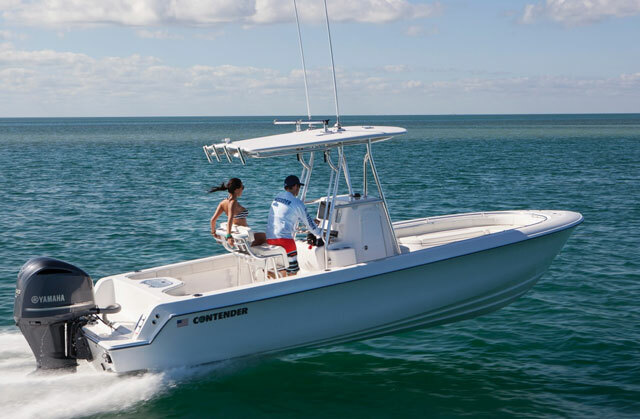 The Contender 27 Open is a “top-quality center console with the kind of … features fishermen love,” according to Ed McKnew in The Power Boat Guide. Those features include standard twin cockpit fishboxes, a raised transom live well, a forward fishbox and a transom door. The 27 Open has a simple, unencumbered layout with plenty of deck space and easy access all around the boat. 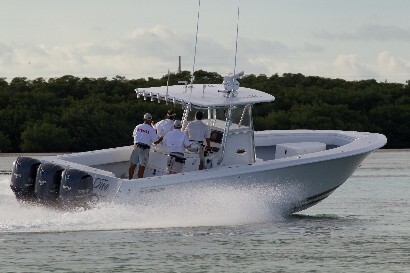 Recessed grab rails and toe kicks add to the boat’s fishability. 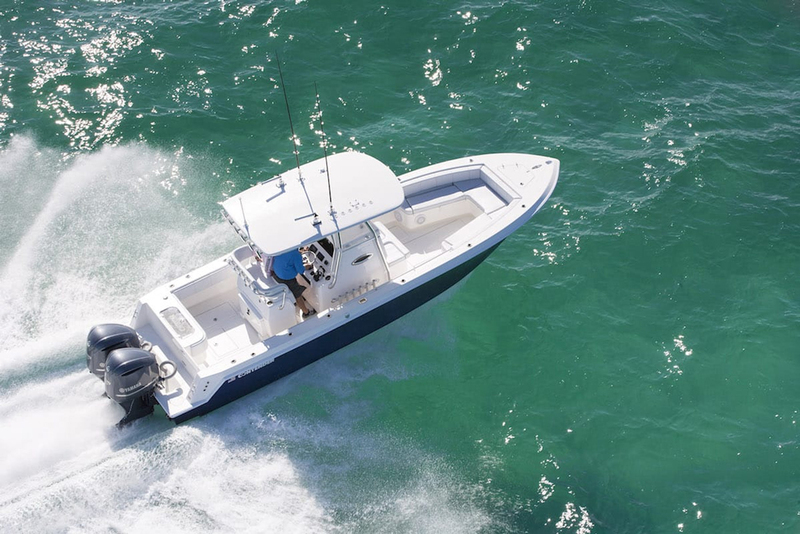 Construction includes a PVC-cored fiberglass stringer system and foam flotation, and the boat has a contemporary look, with clean lines and an even sheer from the moderately flared bow to the transom. Most boats are fitted with a T-top and rocket launchers. 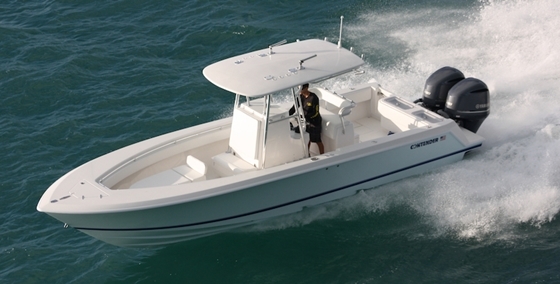 The centerline console has the wheel to port and engine controls to starboard. Above the in-dash gauges is a protected box for the big-screen electronics, and there’s a standard bench seat/leaning post. The console has room inside for storage or a portable head. 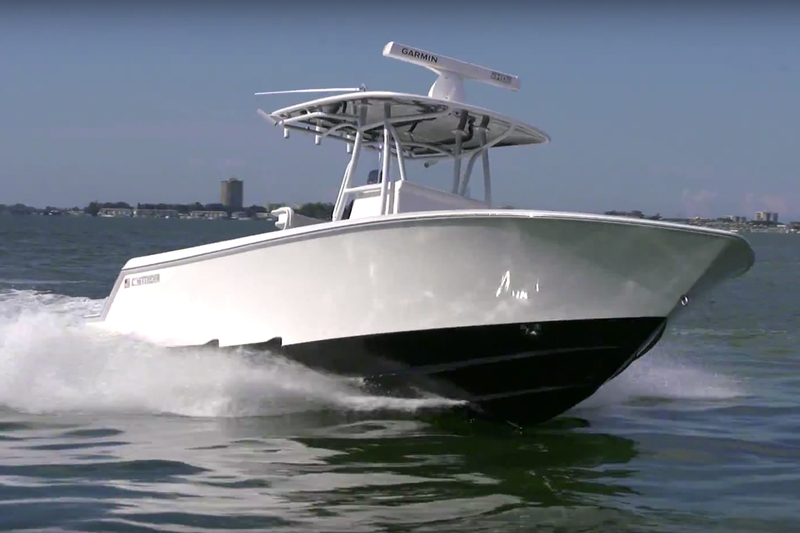 Standard power is a pair of 200-hp outboards for a 30- to 35-mph cruise, while the builder claims a top end of 45 to 50 mph. The boat carries a hefty 210 gallons of fuel. 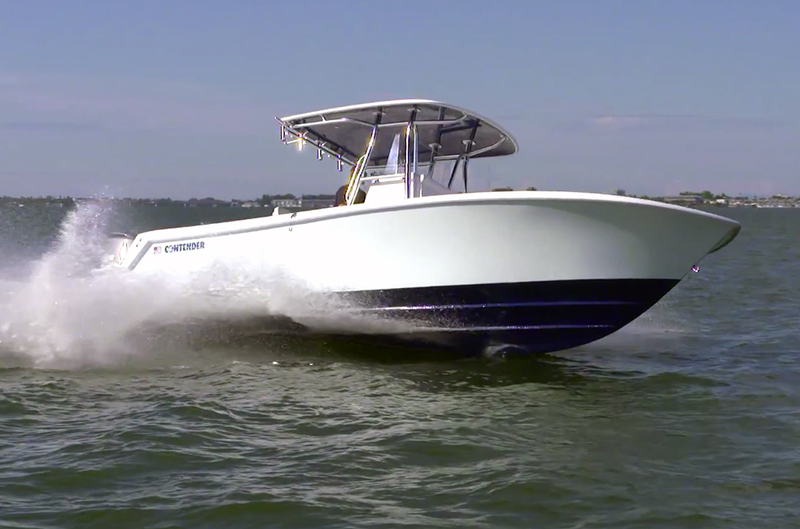 With its narrow deep-vee hull (24.5 degrees of transom deadrise), the 27 Open has a reputation for a soft ride in offshore waters. Steve Knauth is a contributing writer for Soundings Magazine. This article originally appeared in the April 2010 issue.